Several hours ago, Apple revealed its 2018 flagship phones to the world and to little surprise, the Xs with dual-SIM support debuted at a similar price point to its X predecessor, while the upsized Xs Max is Apple’s most expensive iPhone to date. The iPhone Xs retails at US$999, while the iPhone Xs Max will set you back for US$1,099. Meanwhile, the mid-tier iPhone XR starts at US$749. 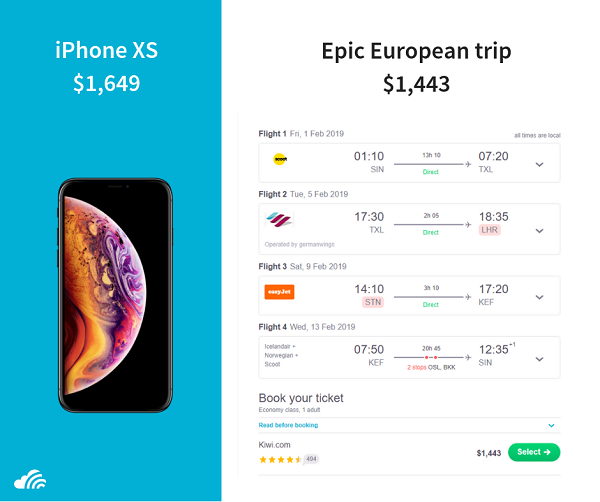 While many continue to lament over the new iPhones’ exorbitant prices, Skyscanner Singapore has decided to take advantage of the matter with a clever ad.